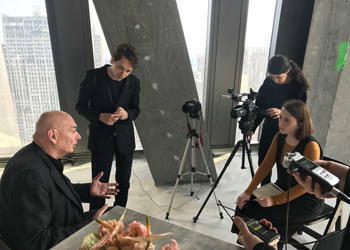 Sitting on the 67th floor of 53 West 53rd — still a bare, wide-open concrete slab —Jean Nouvel said he wished he’d also designed the tower’s interiors. He’ll get a small chance, however, to display his vision for the building’s interior: He’s designing one of the apartments. He later added that for marketing reasons, the developers felt the 145-unit building’s interiors needed to be “more classical” than the modern exterior. Prices at the tower, which has a $2.1 billion projected sellout, range from about $3 million to $42.5 million. Corcoran Sunshine is handling marketing. Nouvel spent more than a decade on the 1,050-foot-tall tower, due to a series of recession-related delays. The project’s original design was 200 feet taller but only gained city approval when a scaled-down version was proposed. 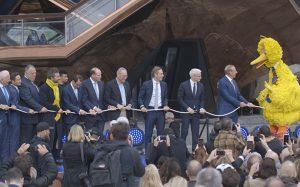 Nouvel said the change required him to “start over,” resulting in a tower that captures the “spirit” of the original. 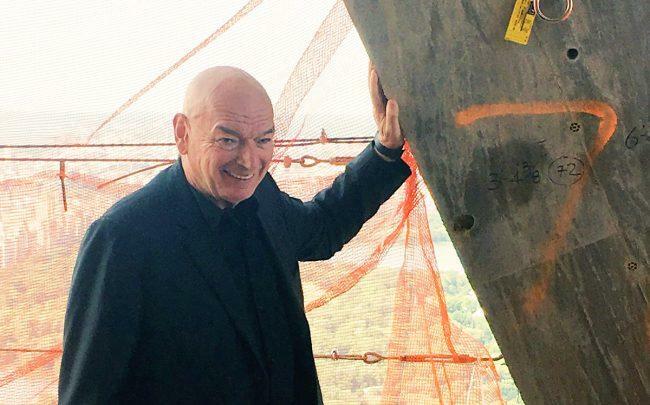 During a topping off ceremony on Thursday, reporters were granted access to the building’s 67th and 81st floors. Attendees sampled the building’s panoramic views, which include Central Park, the tower’s competitors along Billionaires’ Row and the Hudson River. The full-floor unit on the 67th floor — though not yet built out — showed the interplay between the diagonal support beams and the floor-to-ceiling windows. Perhaps most striking about the building is its tapered shape (a product of the smallness of the project’s site) and the irregular, diagonal grids that accent its facade. Though reminiscent of the nearby Hearst Tower and some of Nouvel’s other geometric exteriors, the facade and shape of the building were partly inspired by the drawings of Hugh Ferriss, Nouvel said. Ferriss was an architect and illustrator, well-known for drawings that appeared in the 1929 book “The Metropolis of Tomorrow.” Those images envisioned what the city’s newly minted zoning law would mean for design (some of the drawings have a very “Fortress of Solitude” feel). Nouvel said the tower is “designed to be exactly here,” rather than parachuted into New York, as he feels other buildings seem to be.